Redland City Mayor Karen Williams said she was excited by the exceptional national and local talent that would be on show following recent auditions. “During the evening you will see our special band of volunteers collecting for this most worthy cause so, if you can, please consider a gold coin donation to provide some much-needed support and cheer,” Cr Williams said. Event parking will be available or you can travel by bus or train for free on selected routes. 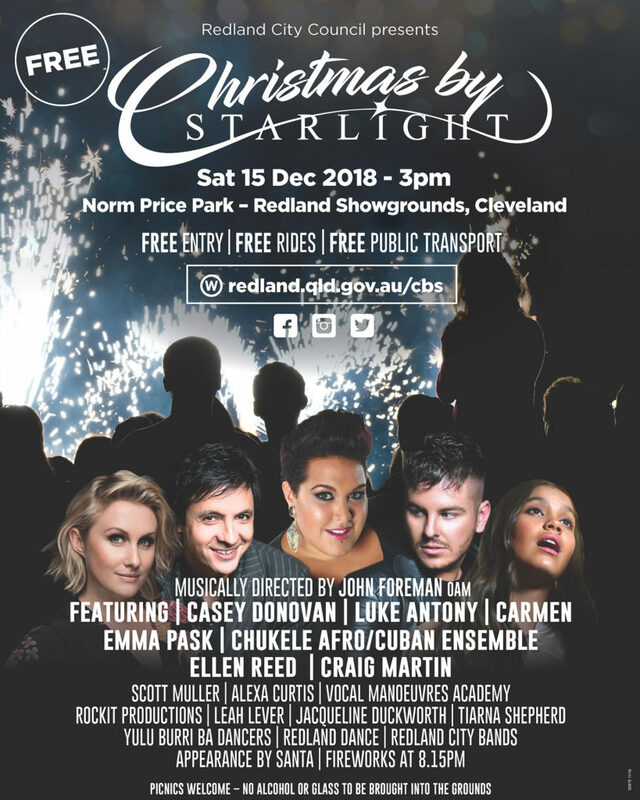 Visit Council’s website to register for your free Translink bus or train tickets and for Christmas by Starlight updates including the line-up, what to bring and further details on the free transport options. Christmas by Starlight is proudly supported by event partner Event Manoeuvres and sponsors Redland City Bulletin, Lendlease, M2 Electrical, Alex Gow Funerals, Darwalla Group, Energex, Gadens, Lee’s Environmental, JJ Richards & Sons, Mr Fireworks, Cleveland District SHS and Redland Museum. For more information, visit the Christmas by Starlight page on our website.